The Red Ride Tour is determined to continue blazing that trail. Rosary Spense and the Johnny’s to play Nipissing at the Big Medicine Studio Wednesday, May 4th, doors open at 7pm with the addition of a surprise new player! So, it began when I met with members of the Red Ride Tour in Toronto in 2014. I was doing some jury work for the Ontario Arts Council and one of the members Cris Derksen was on the jury with me. She gave me a CD of her music and I instantly loved it. In 2015 when the Red Ride Tour said that they were beginning and the White Water Gallery was already booking for its Dream Big Conference, it just made sense to book them. That’s when I met Kristi Lane Sinclair as well as Derek Miller. The whole concert set up was great as the music was top notch. The acoustics in the Capitol Centre cannot be matched in our region for a hall that size and the show was a huge success. Earlier this year I received an email from Kristi saying that they wanted me to help them book a hall locally as the start to the 2016 tour. I was honoured! I feel like the tour does a lot of good for Canada both as a sweet entertainment music gig, and, as engaging all-audiences in an Indigenous art experience. 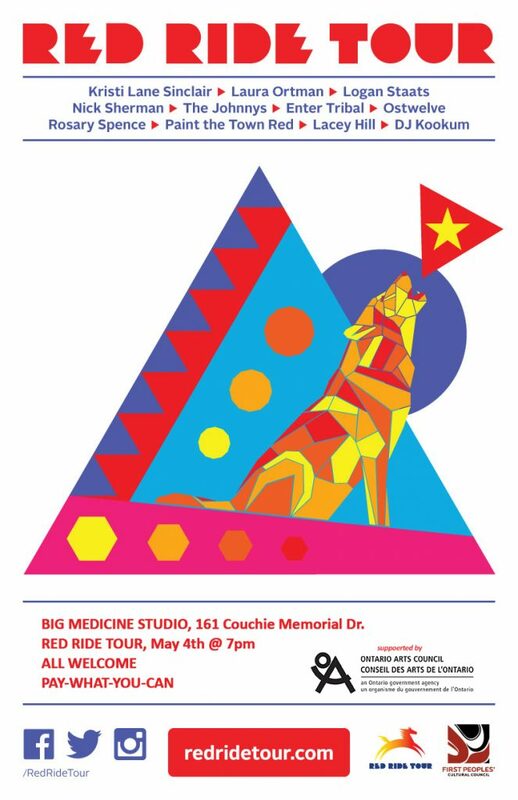 This year is the sixth Red Ride Tour and was scheduled to kick off May 4th with Kristi Lane Sinclair opening. We just received word that Kristi has broken her arm, which is a bummer for any guitar player. She is getting things checked out before rejoining the tour after the scheduled performance in North Bay. Replacing her for this one show is Arthur Renwick a blues roots master from Toronto. Although Kristi will be missed, Arthur brings a lot to the table making the opening of the Red Ride Tour an exciting show. Tickets are available at the door, PAY-WHAT-U-CAN. All welcome. Zakide would like to acknowledge the support of the Ontario Arts Council for their Aboriginal Presenters in the North: Music Events program. This support allows events like this to take place and connects our region with the larger Indigenous scene. Thank you.